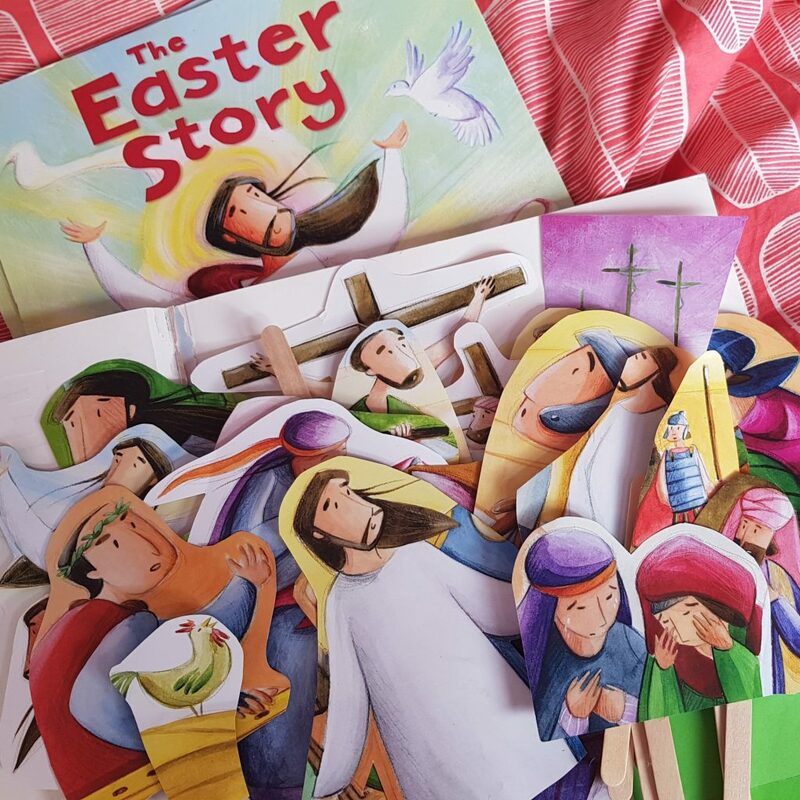 Tell, re-tell and explore the Easter story using simple paper-people-glued-onto-lolly-stick-puppets. This is something I made using The Easter Story book which is about £5 but available in a pack of 12 Bible story books from The Book People for under £12. I wanted a way to play the story, although I could have photocopies the pictures, buying a second copy of the book outweighed the cost of the colour copying! If I make a set of each book, I’ll have a book version to read and a set of puppets for 12 Bible stories for under £2 per story! The only thing I added were some lollysticks, which I buy in such bulk there’s always some in the cupboard. When I made it, I simply cut out the people and a few extra items such as the three crosses and the rooster and glued them onto lollysticks. I didn’t cut them out close to the picture, but just in a soft outline about 1cm away from the person, which made them quicker to cut out and means they are less likely to get damaged. If you’re doing this for under 5s, you might want to pick one picture of each character in the story, preferably one which can be used through out the story. Since my children are in the 5-8 bracket, I figured they might appreciate the choice of which picture of each character to use at the different stage of the story. I set this out with the puppets of the same character stacked so they could easily find them and focus on their telling of the story and not sorting the puppets. You could also pick a few characters, maybe Jesus, Peter and Mary and re-tell the story using just these characters. This would lead to a deeper exploration of the story from their perspective. You could use the puppets to ‘act’ the story as the story is read, or read the story then use the puppets to re-tell the story. Don’t forget to leave them out for further playful exploration. Children often explore their ideas about Bible stories and how they relate to them in their play, inventing their own words for characters and sometimes introducing other characters, or taking the Bible characters to other ‘worlds’. This is fascinating to watch, and even better to join in with! Older children might enjoy creating their own film of their puppet show!